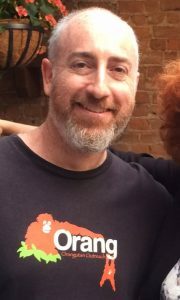 Richard founded Orangutan Outreach in 2007. The organization’s goals are to bring attention to the crisis facing orangutans in the wild due to deforestation and the expansion of palm oil plantations into previously undisturbed areas of forest, and to raise funds for orangutan conservation projects in Borneo and Sumatra. Orangutan Outreach collaborates with many partners including the Borneo Orangutan Survival Foundation (BOSF), International Animal rescue (IAR), the Sumatran Orangutan Conservation Programme (SOCP), the Centre for Orangutan Protection (COP) and the Orangutan Information Centre (OIC). Orangutan Outreach has been able to successfully build a global grassroots network and help foster awareness of the plight of orangutans among people from every walk of life. This awareness has led to a steady growth in charitable donations and virtual orangutan adoptions. By offering people everywhere the chance to get involved and do their part to help protect orangutans, Orangutan Outreach has brought renewed hope that together we can save the red apes.